Beyond Duke Learning Innovation, several programs across Duke University offer grants, funding and other support for innovative teaching and pedagogy. Bass Connections brings together Duke faculty and students to explore real-world issues in interdisciplinary research teams. Bass Connections provides opportunities for Duke faculty to co-lead a Bass Connections project team, participate on project teams as a contributor, and design and teach interdisciplinary courses and other research experiences that engage students. Duke AHEAD (Academy for Health Professions Education and Academic Development) promotes excellence in the education of health professionals by creating a community of education scholars, fostering innovation in health professions education, supporting outstanding teachers, providing faculty development programs and facilitating quality education research. DukeEngage provides funding for select Duke undergraduates who wish to pursue an immersive summer of service in partnership with a U.S. or international community. 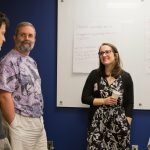 Duke faculty members can submit a proposal to lead their own DukeEngage program. Duke’s Focus Program is an interdisciplinary learning and living experience for Duke first-year students. 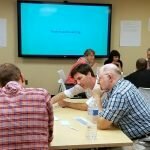 Duke University faculty are recruited for Focus learning communities each November. 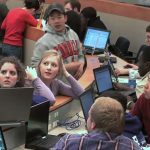 Humanities Writ Large is a five-year initiative aimed at redefining the role of the humanities in undergraduate education. Funding is available for faculty to participate in several components of the initiative, including Emerging Humanities Networks, Humanities Labs, and mentored undergraduate research. The Duke Language, Arts and Media Program (LAMP) is an undergraduate program focused on building strong, contemporary communication skills in students and offers course development grants and workshops for Duke faculty. LAMP includes the Archives Alive Initiative, which creates courses that enable undergraduate students to develop innovative and significant projects based on original materials held in the David M. Rubenstein Rare Book and Manuscript Library. Duke Service-Learning, a program of the Trinity College of Arts & Sciences, connects academic curriculum to communities to foster enriched learning and engagement in ethical collaborations. Service-Learning provides support and assistance to departments, programs, and individual faculty members seeking to integrate service-learning into their academic objectives. Duke Signature Courses are wide-ranging, theme-based courses that integrate perspectives from across academic fields of inquiry and provide a common intellectual experience for broad groups of 50 to 120 undergraduates. Faculty from all Trinity College of Arts & Sciences departments are eligible to submit proposals for Signature Courses. Duke University’s Innovation and Entrepreneurship (I&E) initiative, in partnership with the Social Science Research Institute (SSRI) and the Education and Human Development Incubator (EHDi), offers a Social Innovation and Entrepreneurship Faculty Fellowship. The two-year fellowship is focused on supporting Duke faculty who are interested in incorporating social innovation and entrepreneurship into their teaching and work. The Teaching for Equity Fellowship, open to faculty of all ranks, is a year-long series of workshops that provide tools for addressing issues around identity, race and racism in our classrooms. The Thompson Writing Program (TWP) helps students develop as writers from their first through senior years at Duke and beyond. TWP provides support for Duke faculty across campus in their work with student writing, from consulting on assignment design or developing a new W-coded course to offering workshops on giving feedback and grading. It also sponsors the Duke Faculty Write Program, which builds communities to advance faculty writing, pedagogy and research.